Nestled in the heart of Texas in the lush Brazos Valley, Arbin’s headquarters and production facility is located in College Station, spanning approximately 65,000 square feet and housing our administrative, manufacturing, R&D, marketing, support, sales, and operations personnel. 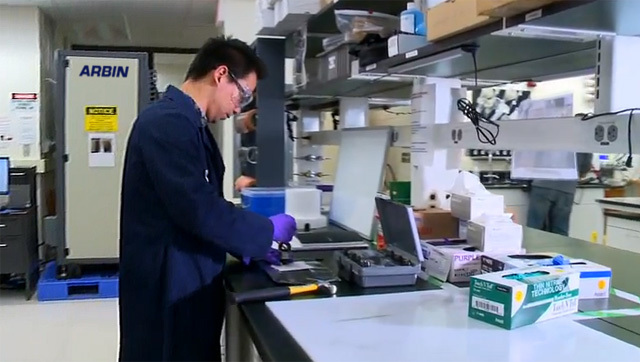 Arbin was founded by Dr. John Zhang in 1991, after discovering the need for a more accurate, reliable and robust testing system for electrochemical storage devices. As an electrochemist himself, Dr. John turned to his garage to start building the first instruments and over time grew into the multi-million dollar, global corporation known today. He focused on Arbin’s founding principles by pursuing innovative products, dedicated, happy employees, and quality customer service, which led to rapid growth both in the US and around the world. Dr. John has over ten patents to his name that are utilized in our products and he remains our chief research and development scientist. Innovation through research and development has been a core value for Arbin since the beginning. We were the first company to offer a multi-channeled potentiostatic/galvanostatic device, multiple current ranges, the ability to simulate telecomm pulses, and now the first to offer true high-precision testing capability for high currents (up to 200A)! This resulted from a three year ARPA-E project partnered with Ford Motor Company and Sandia National Lab. This is one of several custom engineering projects we have achieved while collaborating with leading industry partners. Today, Arbin Instruments is a leading global supplier of testing instrumentation for the energy storage market. We have offices around the world in Germany, China, Korea, Taiwan, along with our headquarters in College Station, TX. Additional worldwide representation is available through over a dozen agents. At Arbin, we understand the vital role energy storage plays in our everyday life and its importance to our future. This is why we work hard to provide the best service and testing equipment as a tool for both researchers and industry.